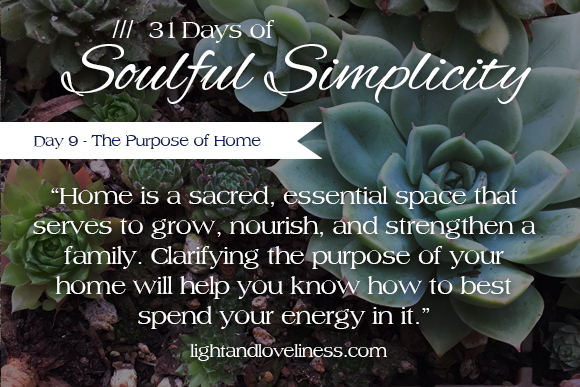 This is day 9 of Soulful Simplicity, a 31-day series through the month of October. The first week of the series can be found here. I hope you are enriched by this series. If you have any questions or would otherwise like to connect, feel free to send me a note: lightandloveliness [at] gmail [dot] com. What is the purpose of home? It may seem obvious, but I think its a worthwhile question. After all, home is more than walls and rooms, floors and ceilings. If it were merely a building to keep some things in and some things out, we wouldn’t differentiate homes from any other building. But home isn’t just any other building. It is a particularly special place where some understated-but-important things happen on a daily basis. To illustrate, I compiled a list of what home is—some from my own sentiments of what home is or ought to be, and some from a few close friends who weighed in for me about what they believe the purpose of home to be. I hope some will resonate with you and assist in the process of helping you to soulfully-simplify your home for the benefit of your family. Home is a refuge. It is a place of comfort and rest; a sanctuary and soft place to land. Home is a place of worship. It is a holy space where I engage ordinary tasks as a demonstration of gratitude for what God has given into my care. Home is a greenhouse. It is a carefully curated environment intended to nurture, support, and develop the character of little ones into honorable, upright men and women. Home is a kitchen. It is a place where hearts and bellies are filled with goodness, and where our table becomes a gathering place to offer my family gifts that nourish their bodies and their souls. Home is a workshop. It is where we build a life together, fusing memories and shared experiences into a bond of lasting love for one another. Home is a place for hospitality. It is a place where insiders and outsiders alike are welcomed in, are seen and heard, and generously poured into with attention and care. Home is a garden. It is a place that has a season for planting, a season for blooming, and will one day produce a harvest revealing what is sown there. Home is a workplace. It is a place I must show up to daily, ready to work diligently on mundane tasks that establish and preserve the peace of my household. Home is an anchor. It is a place that reminds me of what is important, and acts as a hub to return to when adventures and seasons come to an end. Home is a dance party. It is a place to sing at the top of my lungs, dance silly with my wide-eyed littles, and scoop them up for whimsical twirls and cuddles. Home is a heart. It is the place that pumps life to the family, and a place that—when deeply damaged—is difficult to heal from. Home is a family. It is where we all invest in each other, journey together, and sharpen each other. It is where we grow, learn, forgive, and laugh together through everything we experience. Home is sacred. It is a essential space that serves to grow, nourish, and strengthen a family. Clarifying the purpose of your home will help you know how to best spend your energy in it.